There are some genera that are relegated to the depths of one's horticultural awareness until something happens. They are plants that have never really caught the attention even though you may know of their existence or even grown them in the past. Thalictrum came into that category for me. My mother used to grow a few clumps. She was a flower arranger and liked maidenhair fern but always managed to kill plants of that, so opted for the similar foliage of the easier to grow Thalictrum. 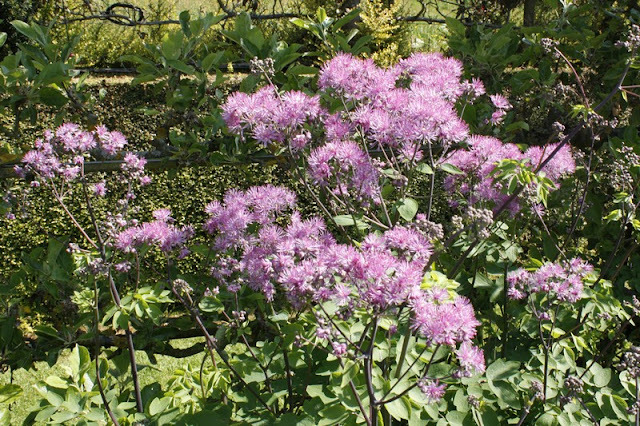 A few years back a nurseryman friend gave me a Thalictrum as a thank-you for something - I forget what and I planted at it the back of my front garden where it's just reached about 6ft! I think its T. aquilegifolium but is rather tall for the description of this species. Anyway I still wasn't really taking much notice of this - it was just a background plant. Small leaves and delicate flowers aren't my usual thing! My plant reaching for the eaves! 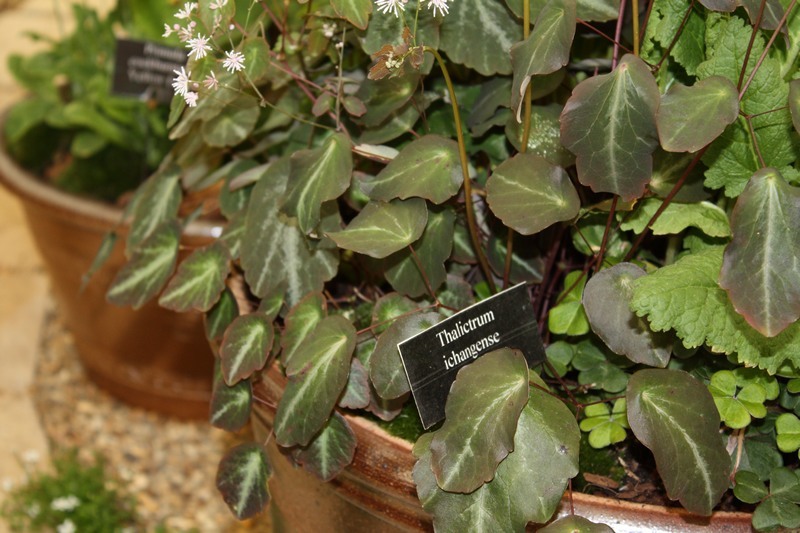 However a few weeks ago I was looking for some low growing plants to soften the gravel edge in my back garden and was considering an Epimedium, which I love, then saw this little diminutive Thalictrum ichangense and it was love at first sight. Lovely soft bronze foliage with diffuse white vein markings. Apparently it will flower continuously from spring till autumn. It originates from China and was first available in the nursery trade around 2004. 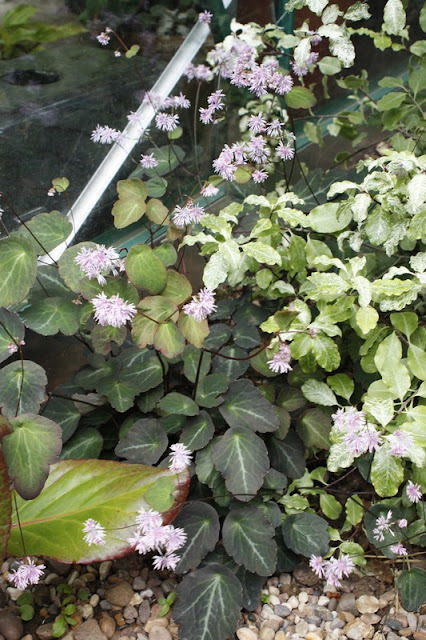 I bought one and planted between a variegated Pittosporum and a new Bergenia at the base of my new greenhouse. Its just started flowering and is a little treasure! I'm converted! This little gem has revised my thinking of Thalictrums - not just old-fashioned cottage garden plants but nicely sophisticated ground cover! It is a lovely genus, and much underrated. Your plant is too big for Thalictrum aquilegiifolium [note the double ‘I’ in the specific]. I’m guessing the flowers are pinky purple; if so it is probably Thalictrum rochebrunnianum with T. delavayi as another possibility. I’d need to see flowers to be sure. 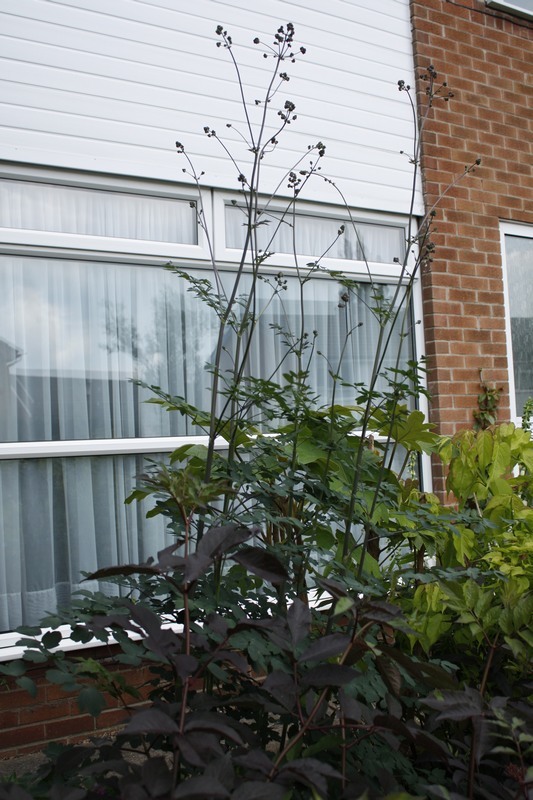 Are the purple leaves in front of it a purple form of Clematis recta? I’ve seen ‘Velvet Night’ looking wonderful in other people’s gardens but have failed to grow it well myself.